Our first stop was a visit to the Gordon Biersch Rockville restaurant and its head brewer, Christian Layke. 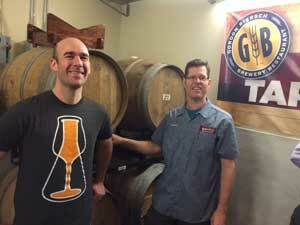 Christian is a former homebrewer and has been with Gordon Biersch for around eight years. He left a job with a non-profit environmental think tank to work with stainless steel tanks instead. Christian collaborated with Mike seven months ago to brew the Flemish Red. The recipe is said to be heavy on crystal malt to give the beer a substantial mouthfeel heading into barrels and spending months with hungry microbes. Christian chose Simpsons Double Roast Crystal as an alternative to Special B, saying that DRC has notes of raisin, dates, and dark fruit while being more sweet and rounded than Special B. Primary fermentation was with the Saccharomyces portion of the Roeselare strain from Brewing Sciences Institute. After primary fermentation, the beer was split between four red wine barrels, which had been prepared by filling with boiling water and being left overnight. Christian and Mike weren’t looking for wine character. This is the first use for the barrels after the winery. Barrel one was pitched with East Coast Yeast ECY02 Flemish Ale harvested from a sour honey homebrew ale from Mike’s home cellar. Bright Yeast Labs Flanders Blend went into number two. Barrels three and four each got a dose of Brewing Sciences Institute Flanders Red Blend with Pediococcus added. Christian and Mike pulled the sampling nails on the barrels and gathered enough of the precious stuff for us to taste how more than half a year of aging had treated the beer. 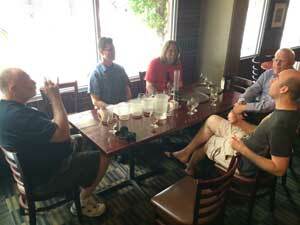 Joining in on the tasting were Steve Wilkes, Andy Sparks and Bob Stempski. Clean lactic sourness, not too dry. A little leathery. Dark fruit, raisins and dates. Not too aggressive on the palate. 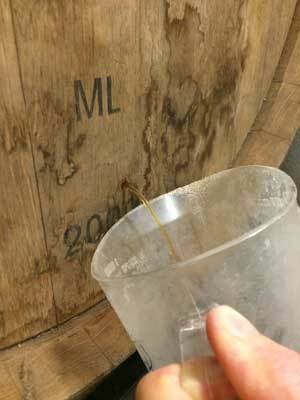 A bit of the oak from the barrel. A bit of sulfur or egginess initially on the nose, which may blow off with time. Sulfur dissipated in the glass. Perhaps also diacetyl? A little bit of barnyard. Less tart than number one. A little raspberry in the finish. Mouthfeel perhaps a little thinner than barrel one. Clean, lactic, tangy sourness. Most tart. Bright, cherry tartness. A bit of leather. Little sulfur on the nose. Our favorite. Full and complex flavors. Not as aggressively sour as number three. Less wood character than three. Full body. All of the beers were interesting and tasty in their own way. We were very intrigued by how different each beer was from the others – even the beers pitched with the same microbes in barrels three and four. For Mike, it shows how limited a homebrewer would be if he or she only had one fermentation vessel to sour a beer instead of dividing up the beer to be blended later. After we tasted the samples individually, Christian poured equal portions of each beer into a graduated cylinder and served the blend. The result was a delicious beer that we judged to be superior to the individual components. The blend had brightness, fruity flavors, sufficient body, a leathery characteristic, more tart cherry notes than the individual beers, with a hint of tobacco. I’m presuming Christian and Mike will play with different ratios of the four components, but it will be hard to beat the even split. When I mentioned the tasting to homebrewers at the conference, most were surprised that something so adventurous would be happening at a Gordon Biersch restaurant. With 32 locations listed on their Web site nationwide, the corporation doesn’t have a reputation for being cutting edge. However, Christian says the company now encourages local head brewers to be creative. So, out of 12 or 13 beers on tap, only three or four will be “legacy” company recipes. The rest will reflect the talents of the local brewer. Recipes must be approved by the corporation, but local brewers are given the freedom to brew and serve beers that appeal to the areas they serve. The Tonsmeire-Layke collaboration will likely be on tap before too long. Christian is leaving Gordon Biersch in the next couple of months to work on starting his own brewery. We wish him the best of luck and hope all of his beers are as delightful as this one. Many thanks to Christian for the generous hospitality and to Mike for being an excellent tour guide. This was only stop one of several on our whirlwind Wednesday. Basic Brewing Radio is on its annual June hiatus but will return in July with tons of good content collected in the Baltimore/D.C. area. The Seattle brewpub has consistently done well in local and national awards based on blind sampling. Just last week they won Gold in European Pale Lagers, Gold in Irish Stouts, and Gold in Belgo-American & International Ales at the Washington Beer Awards. Hey, Chris, it’s spelled “Roeselare”.